The Iskandarian is the official newspaper of Iskandar Malaysia. The Iskandarian is published every month. 30,000 copies are distributed in Malaysia and Singapore. 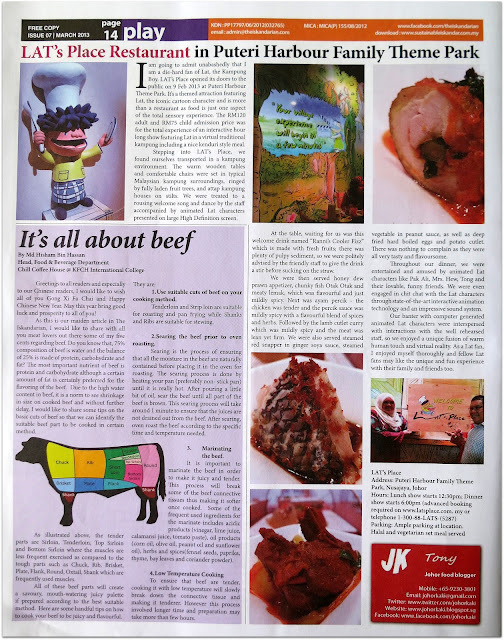 Johor Kaki is featured in every issue of The Iskandarian beginning with the Mar 2013 issue. Johor Kaki article on Lat's Place is featured in the Mar 2013 issue of The Iskandarian. Click on photo above to view the original Johor Kaki post on Lat's Place. Johor Kaki article on Tam Zabb Lao and Thai is featured in the May 2013 issue of The Iskandarian. Click on photo above to view the original Johor Kaki post on Tam Zabb Lao and Thai.